Our students all worked very hard this semester. As the semester wraps up, we’re getting ready to recognize the achievements of everyone in the class of 2018 at the Fulton Schools Convocation ceremony. 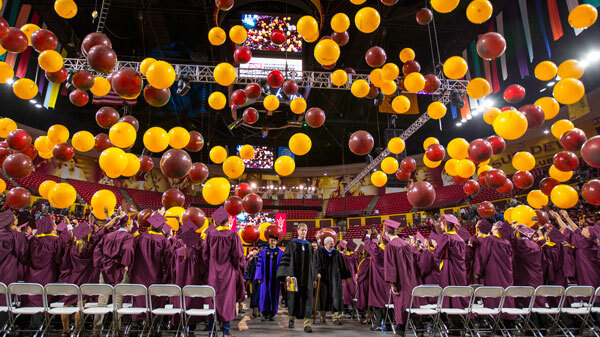 Commencement is the general ASU ceremony that marks students’ graduation. Show your Fulton Schools pride and cheer on the whole class of 2018 graduates at Commencement! Special Interest and cultural Convocations are a time for smaller groups to gather and celebrate students’ graduation. The smaller setting provides the opportunity for individual recognition. Join your students at these special ceremonies. Celebrate the accomplishments of our students at Convocation! Be aware of the ASU Bag Policy at Wells Fargo Arena. Volunteer and help make Convocation a success! There are a few spots left to sign up to volunteer! Any role with “(STAFF)” in front is only open to Fulton Schools benefit-eligible staff. Roles without that starting designation are open to anyone – faculty, staff, student workers and students. Roles are available from Monday, December 3, 2018, through the Convocation event on Tuesday, December 11, 2018.